Fed-up with faddy diets? Looking for a sensible, simple, healthy eating plan? Then the GL diet is for you. Stick to foods that are low in GL and you'll control your weight and improve your health. Our expert author team explain the science behind the plan, help you incorporate GL diet principles into your everyday life, and give you 70 easy-to-follow, low-GL recipes to try. Nigel Denby and Sue Baic are registered dietitians, GL diet pioneers, and the co-authors of Nutrition For Dummies. Chapter 1: Introducing GL: Healthy Eating in the Real World. Chapter 2: Checking Out the Science behind GL. Chapter 3: Starting Your Low-GL Plan. Part II: Shopping and Eating Out. Chapter 4: Cruising with Confidence: Low-GL Shopping and Eating on the Run. Chapter 5: Table for Two? Eating Out GL-Style. Part III: Morning to Night Recipes. Chapter 6: Starting Your Day with a Low-GL Breakfast. Chapter 7: Doing Lunch: Low-GL Lunches at Home and on the GO. Chapter 8: Delectable Dinners: Low-GL Suppers and Ideas for Entertaining. Chapter 9: Just Desserts: Virtuous Low-GL Puddings. Chapter 10: Smart Snacks: Low-GL Quick Bites and Healthy Nibbles. Chapter 11: Replacing Common Ingredients with GL-friendly Alternatives. Chapter 12: Placing GL in the Healthy Living Jigsaw. 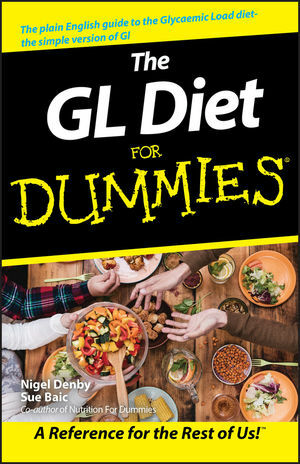 Chapter 13: Medical Benefits of the GL Diet. Chapter 14: Ten Reasons for Eating the Low-GL Way. Chapter 15: Ten Best GL Web Sites. Chapter 16: Ten GL-Savvy Food Swaps. Appendix: A–Z List of Low-GL Foods.